all the special people in your life are taken care of this holiday season. You've also done your best to serve your clients/patients well all year. Maybe, in the spirit of the season, you've even donated to a charity or cause you support. But what are you doing for you? Why not give yourself a gift that gives you an opportunity to earn 15 or more CEUs, in sessions presented by respected experts, at a gorgeous 4-star resort in the Valley of the Sun, where you can also enjoy networking and interaction with RD colleagues and our sponsor companies? 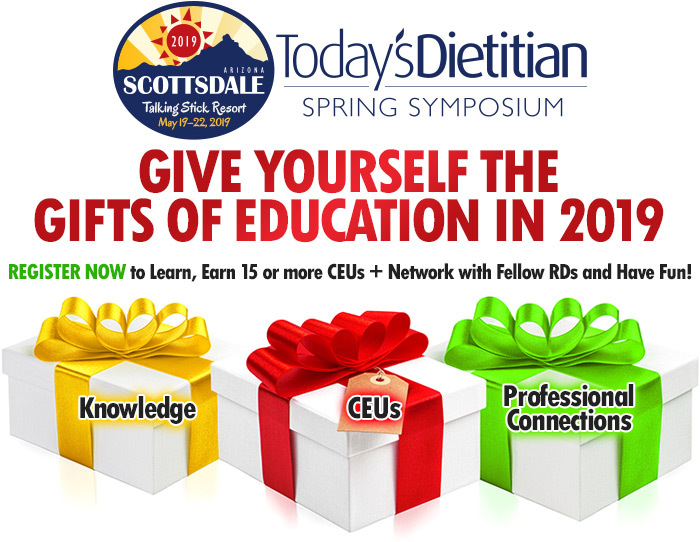 From the picturesque Talking Stick Resort in Scottsdale, AZ, on May 19–22, the 2019 Today's Dietitian Spring Symposium will deliver a continuing education program exclusively for RDs and nutrition professionals, with sessions presented by a first-class line up of experts in the field of nutrition and dietetics. These sessions will provide you with the tools and knowledge you need to provide exceptional counsel to your clients, as well as supplying you with tips to grow your professional career and practice. In addition to the selection of sessions, there will be a host of networking opportunities, peer interaction and product sampling from our sponsors. Unlike any other event designed for dietitians, our Symposium offers a level of engagement, interaction, and meaningful person-to-person contact between our attendees, our session presenters, and our sponsors that is truly different and quite extraordinary for an industry meeting. Join us in The Valley of the Sun and experience what we have in store for this year’s event.